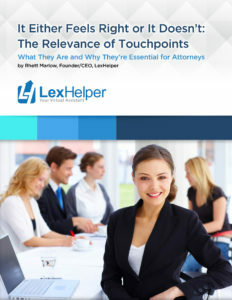 This blog post is a companion piece to the LexHelper white paper “It Either Feels Right or It Doesn’t: The Relevance of Touchpoints.” Download the complete white paper here. 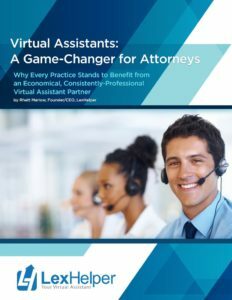 While the quality of your case work is still king, prospective clients are always making judgments on your practice based on the quality of your touchpoints, good and bad. 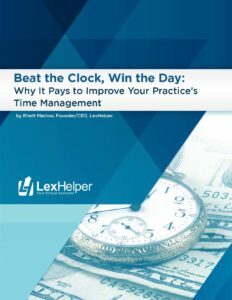 It’s worth your time, energy, and money to get these key touchpoints right. 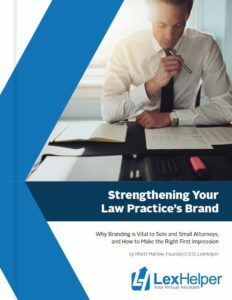 To see how important touchpoints are to shaping your clients’ perception, step out of the legal industry and think about how other brands make you feel when you enter their world. Here are several companies that do it exceptionally well. Whether it’s a live-action feature film, a CGI-driven movie, or one of its classic hand-drawn features, Walt Disney Pictures’ opening title card is a timeless and unmistakable promise to the viewer that they’re about to get spirited away into a family-friendly world of wonder and enchantment. While it has become longer and better produced over time, the Disney intro has always kept two elements consistent – the prominence of Cinderella Castle, an icon of the brand, and “When You Wish upon a Star,” a song that has defined Disney for nearly 80 years. Before the movie even begins, the Disney Studios introduction has already evoked feelings of nostalgia, quality and imagination. If you’ve ever eaten at a Chick-fil-A restaurant, you’ve noticed that the cashiers are always well-mannered and courteous, whether behind the counter or through the pay window. It’s not an indictment of other fast-food restaurants that their staff is necessarily inferior, but Chick-fil-A employees are always particularly polite (“yes ma’am/sir”) and smiley. They also bring your meal to your table when dining inside, or run your bag(s) out to your car for larger orders. It’s one of the reasons why the brand has such an enthusiastic following in its native Georgia and beyond. Somewhere down the line, this Swedish brand figured out that shopping at it labyrinthine, enormous stores could really work up an appetite. Enter the in-store restaurant, and with it, the cinnamon roll. Before hotels and retail brands started to explore “scent marketing,” IKEA was already getting shoppers excited about flat-packed furniture from the parking lot through its pervasive smell of cinnamon. And whether you drop by for large furniture or small home accents, no trip to IKEA is complete without some Swedish meatballs and cinnamon rolls, which are even sold frozen for home baking at store locations. So many retail stores overwhelm and frustrate customers with an overabundance of product, messy aisles, or unskilled staff. Apple has applied its simple and modern product design aesthetic to its in-store experience. Inside, the stores look sparing and linear – products are displayed on shelves against the walls and two or three long tables in the center of the store. The look is clean and minimal and no design feature distracts from the merchandise. Combined with a younger, but well-trained team, and the Apple Store is able to charge top dollar for its devices by making shoppers feel hip, innovative and intelligent. As most corporations sought to cut costs through emerging self-service technologies, Zappos made its mark in the early 2000s by going in a different direction—doubling down on live customer service representatives. Today, whether dialing Zappos on the phone or using its smartphone app, it’s shocking how easy and efficient it is to reach a live person to speak to or chat with. While the brand is less frequent in its discounting, loyalists choose Zappos time and again for the ease of ordering, customer support, and fast, free shipping and returns.